Like that old Barbara Mandrel song, I was Country when Country wasn’t cool. We drank out of mason jars way before it became a trend. Growing up in rural Kentucky I thought everyone had a huge garden and had to spend summers helping to tend it. Every spring I looked forward to playing in the freshly tilled dirt and watching my dad make perfectly mounded rows ready to be planted. That’s where the fun ended for me because I did not enjoy weeding the garden and having to help pick vegetables non-stop for 3 months. When you have hundreds of mason jars around the house you end up using them for beverages. My grandmother made preserves every year and those little jelly jars were the perfect glass to drink juice out of in the morning. They really are the most versatile vessel for any beverage if you ask me! The average person doesn’t worry about the small differences in proper cocktails glassware. Mason jars are a great way to add personality and some southern sass to any cocktail you serve. I even use a wide mouth jar as my “shaker” when I have friends over for a casual get-together. These kits are available at my shop and make great host/hostess gifts. I love a signature cocktail and here are some of my fall favorites. Cheers Y’all! This boozy apple pie creation is a crowd pleaser. 2oz Tequila, 1oz Goldschlager, 1oz orange liqueur, 4oz apple cider. Pour into shaker and mix well. Rim glass with cinnamon sugar and fill with ice. Pour over ice and add apple for garnish. 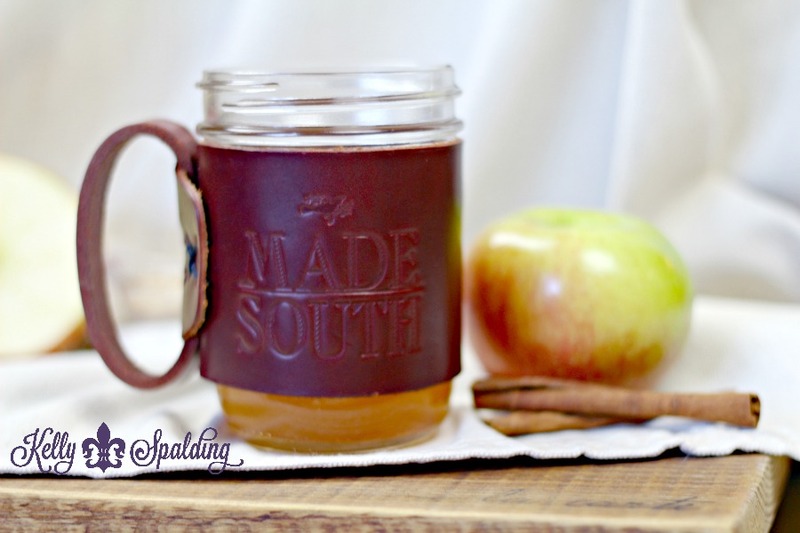 Southerners love their sweet tea….add some bourbon and it’s perfection. 2oz bourbon, 8oz sweet tea, 1 lemon slice, 2-3 mint leaves, 2-3 lemon wheels for garnish. In a small jar, muddle lemon and mint leaves in the bourbon to release the flavors. Fill Mason jar with ice and strain the bourbon over it. Add sweet tea and garnish with lemon wheels and mint sprig. Serving at a party? 1 part bourbon to 4 parts tea. One of my favorite winter cocktails is a variation from the White Russian. (Rum instead of vodka). 2oz rum, 2oz Kahlua, 6oz milk (I use whole). Mix all in shaker. Pour in jar filled with ice. Top with a dash of nutmeg and add a cinnamon stick for garnish.